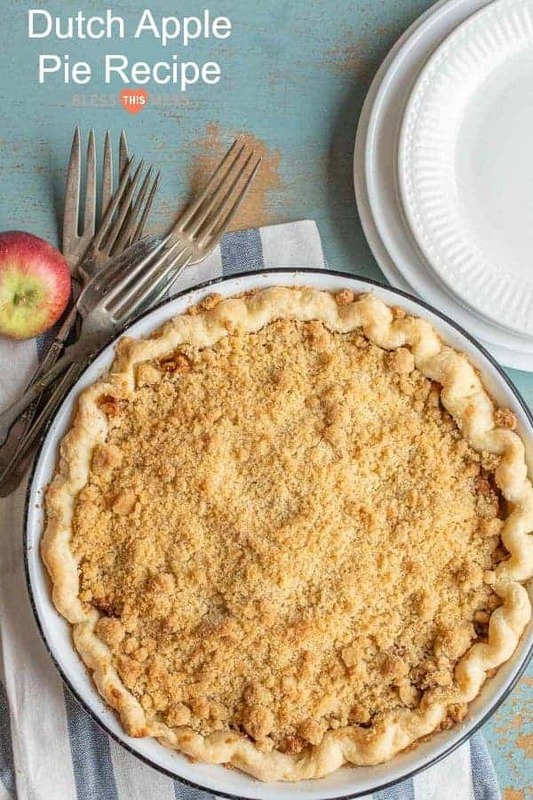 Simple dutch apple pie recipe made with fresh apples, a homemade crust, and a streusel topping with a secret ingredient: cornmeal! The best part about this Dutch apple pie? 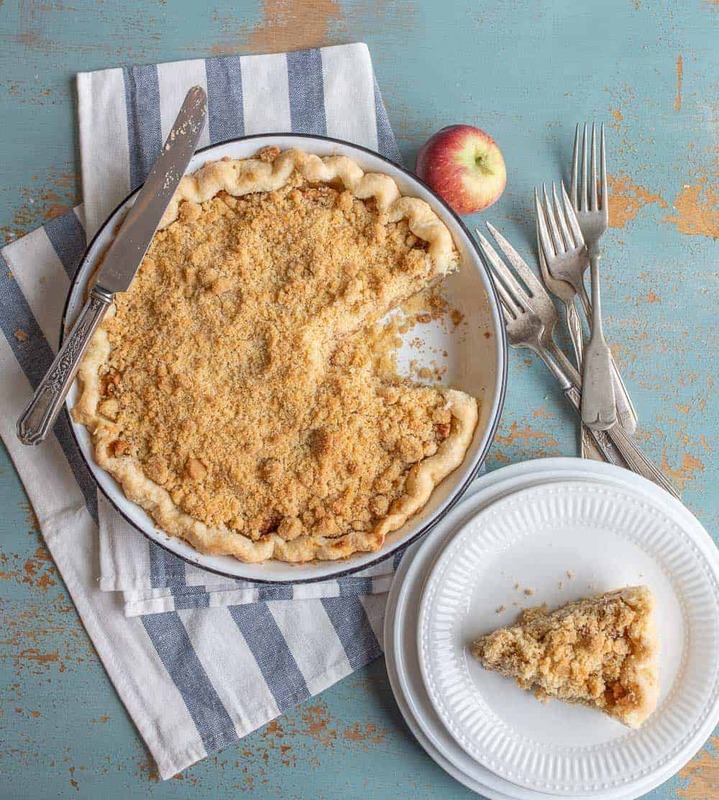 You only have to make a single crust and there’s STREUSEL! Some Dutch apple pie recipes have cream and raisins in their fillings, but I wanted to make this one extra simple and use the same easy apple pie filling I use for traditional apple pie. The streusel on top is so quick to make, has a nice crunch to it, and tastes like pie perfection. 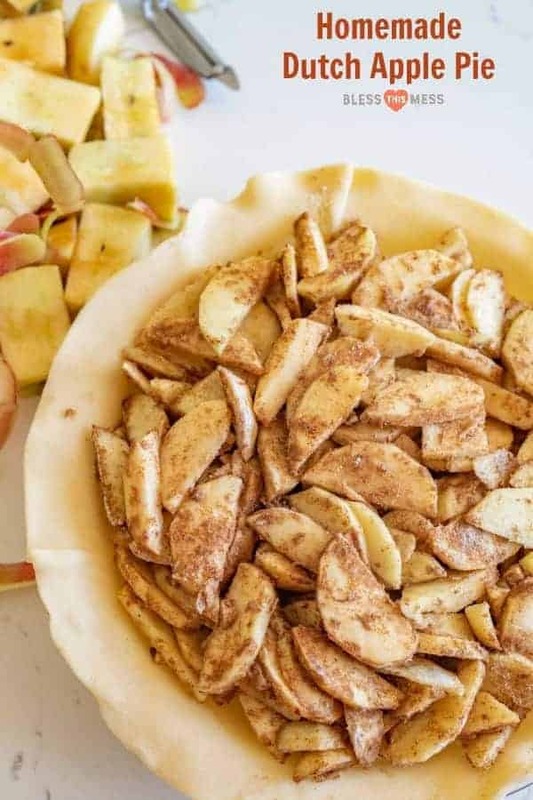 Dutch apple is one of my favorites because it’s pretty simple and the top is casual, so there’s a lot less pressure to make the pie crust look fancy. This is a pretty, rustic, and simple pie, but it tastes so good. After writing a huge post all about pie crust, I wanted to share a few classic, simple, perfect-for-every-holiday pie recipes to go with it. This simple Dutch apple pie recipe is one of my brother’s favorites and so I like to surprise him with one every so often. You can find this recipe plus SEVEN other pie recipes in one post if you are still looking around for something that looks perfect for your Thanksgiving table. There’s something magical about pulling a pie made from scratch out of the oven. It seems to take you back to a time when life was simpler and homemade pie was standard fare in American kitchens. Today, amidst the hustle and bustle of everyday life, taking time to make pie is almost therapeutic. It’s a slower process than opening a box of brownie mix, but there’s so much satisfaction in it. Butter, flour, and sugar are the building blocks of all things good, and making a homemade pie is a pretty great way to use them. Plan to take an afternoon to bake and you just might love how grounding the whole process is for you. Plus, you’ll have a beautiful pie to enjoy after dinner or to share with friends, and that’s a pretty great reward, too. What’s the difference between Dutch apple pie and an apple pie? 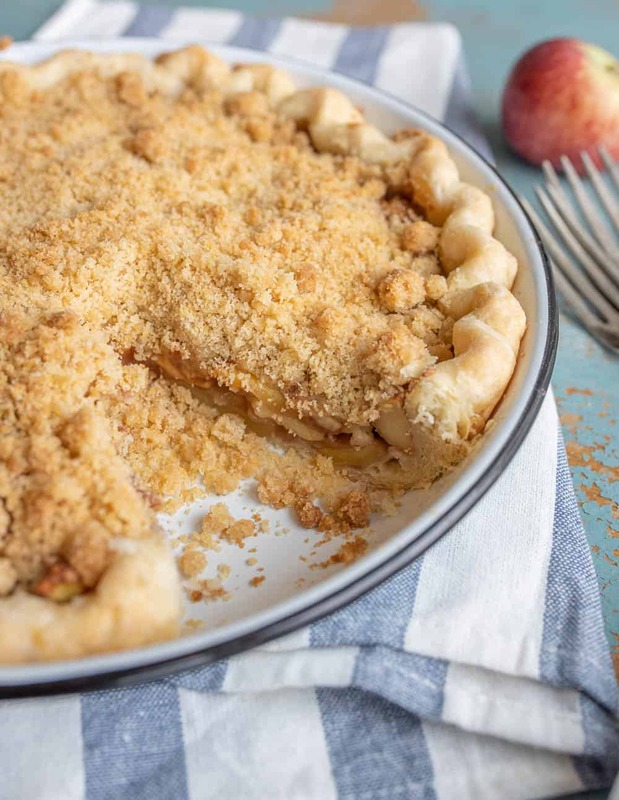 The difference between a Dutch apple pie and a regular apple pie is a streusel topping of butter, flour, and sugar baked on top in a delicious sweet, crunchy twist. It’s easier, and sweeter, than a pastry top, and makes a nice change of pace. If you are looking for a more traditional Dutch Apple Pie recipe (with cream, raisins, and cooked apples), I have made the one from the America’s Test Kitchen Family Baking Book with great success. The streusel part of this recipe comes from their recipe. Pies that use single crusts are my favorite! Make a double pie crust and get two pies out of it. 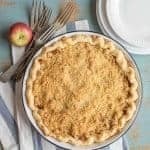 Pair this dutch apple pie recipe with any recipe that uses a single pie crust such as pumpkin, sugar cream, or buttermilk pie and you’ll have two pies made without much fuss. I tried out a whole lot of pie plates when I made all of my pies and these are my favorite. They are deep, have a little lip that makes getting them out of the oven easier, and the glass seems to cook up the pie crust the best. Here’s a post about how to cut apples it you need it. If you peel them first and then cut them this way, it’s the fastest way to get your apples prepped. Try to find a firm apple to use in this recipe. I like a mix between sweet and sour apples. You can use Granny Smith, Jonathan, Jonagold, Winesap, Golden Delicious, Honey Crisp, Gala, and Rome Beauty. I used Golden Delicious from our trees for this pie and it was great. In the world of pies, this one has a low amount of added sugar. If using a very tart apple, you may need to double the sugar. Just adjust to taste. 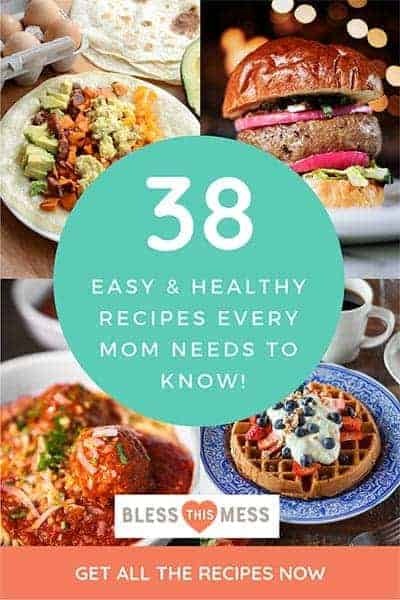 Preheat the oven to 375 degrees. Mix first 5 ingredients together in a medium bowl, mixing together to coat everything well. 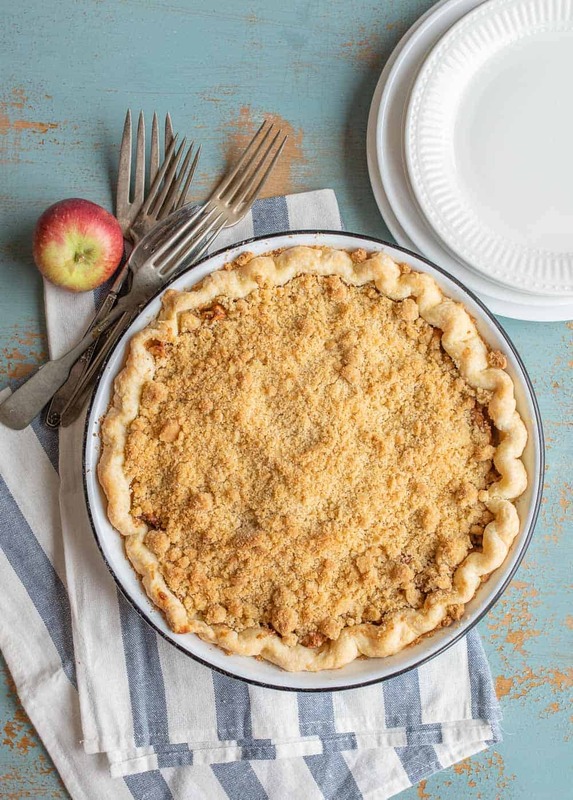 Add the apple mixture to a prepared unbaked pie crust in a deep 9-inch pie plate. Place the apple pie in the oven (with no top on) and bake for 25 minutes. To make the streusel, add the flour, sugars, and cornmeal to a small bowl and whisk to combine. Drizzle the melted butter over the top and stir with a fork until roughly combined. 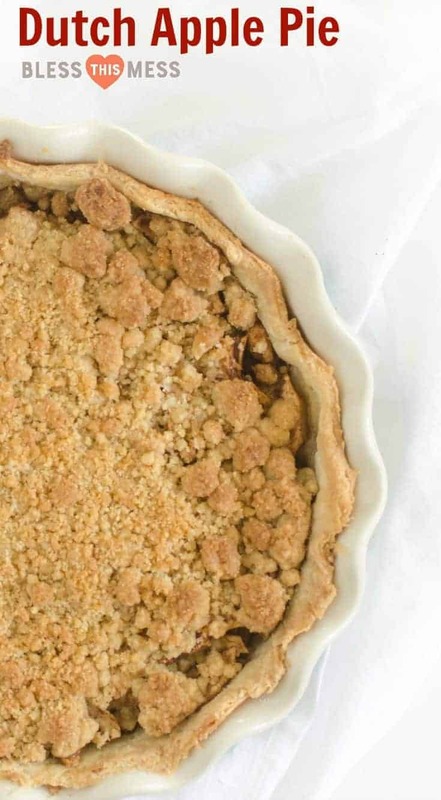 Remove the pie from the oven after 25 minutes and carefully add the streusel topping evenly over the top. Bake for an additional 20-25 minutes, until the crust and streusel have browned. Remove the pie from the oven and let cool for at least one hour. Serve warm or at room temperature. In the world of pies, this one has a low amount of added sugar. If using a very tart apple you may need to double the sugar. Just adjust to taste. All this pie needs is a scoop of vanilla ice cream or some freshly whipped cream on top. That crunchy sweet streusel topping can’t be beat. You are going to love it. 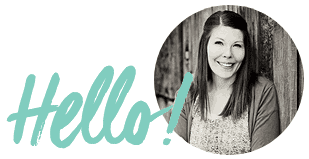 Happy pie-making friends! I’m so excited you tried it! I rarely make traditional apple pie anymore because we LOVE this one!